-Remove and contain pollutants, and to eliminate moisture, stale air, carbon dioxide etc. -Prevent growth of mold and mildew on walls and in insulation To ensure healthy indoor air, a necessary .35 to .5 air changes per hour or 15 cubic feet per minute per person is recommended (with kitchen and bathroom exhaust fan or whole house ventilation), and it is ideal if the home has been built using nontoxic materials, nonpolluting appliances, furniture and furnishings that are free of toxic compounds, and any potential toxicants have been blocked off or guarded against. The best way is always to open windows when possible. Exhaust Fans. One of the most common and least expensive means of ventilating is to use exhaust fans in bathrooms, laundry rooms, and kitchens. Make sure that they are vented to the outside. In an ordinary home, fresh air will come through openings in the building envelope; however, it is best if it comes directly from outdoors. The fans should be used whenever someone is using the kitchen, bathroom, or laundry room, to reduce interior moisture levels. The exhaust fans can also be run during other times to remove stale or polluted air. Whole House Ventilation, Systems are very good (older) systems if you don't have the need for air conditioning. It exhausts stale, polluted indoor air from one opening in the building envelope and draws fresh replacement air into a house through another. 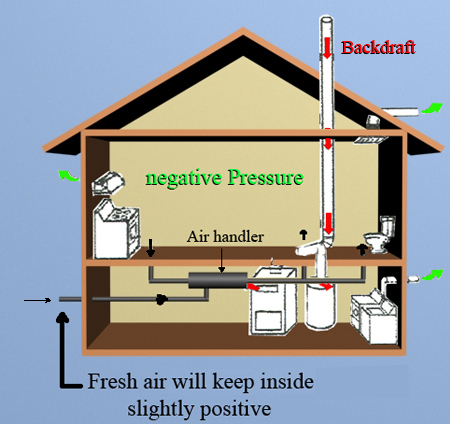 Backdrafting is a dangerous side-effect of over-ventilation and occurs when air pressure in the house is lower than outside air pressure. Running the kitchen fan, bathroom fan, and then a few other exhaust fans, can lead to that negative pressure, which in turn causes backdrafting. Instead of having the carbon dioxide, nitrogen dioxide, and carbon monoxide flow up to the chimney, which it is supposed to do, due to the negative pressure in the house, these gases now will flow backwards into the home. To prevent backdrafting, have the water heater and furnace draw their intake air directly from the outside and supply some fresh air into the airhandler to create slightly positive pressure in the home. Even if exhaust gas is not a significant problem, spillage may still pose a health risk. When using gas and propane, a major problem is the presence of nitrogen dioxide, which can burn and scar lung tissue even in small quantities. Other problematic pollutants include sulphur dioxide, which creates health risks similar to nitrogen dioxide, and benzene, which is a harmful carcinogen produced in wood smoke. 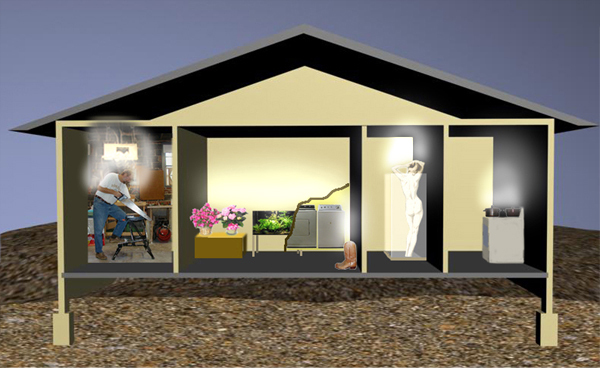 Radon is a colorless, odorless, naturally occurring gas and is the second leading cause of lung cancer. Radon and combustion gasses from furnaces, water heaters, or stoves are naturally-occurring pollutants that can creep into homes and create health risks. Remove from the home any potential radon gas and any other soil gas, such as methane, water vapor, and gasses released by pesticides. (For more info) An inexpensive "do-it-yourself" radon test kit can be bought at local hardware store. The humidity inside the home must be controlled to prevent mold outbreaks. Mold can grow anywhere, but it tends to flourish in moist areas that are dark and have poor circulation. Moisture control (below 60%) with good filtration is also the best solution for dust mites (bacteria that can cause allergies and asthma). VOC's (volatile organic compounds) are emitted by products like paints, finishes, cleaning supplies, pesticides, building materials, furnishings and glues, but also from office equipment, copiers, and printers. Make sure that these products are being used in well ventilated areas. Store the chemicals in a sealed the storage area vented to outside. Reduce the source of contaminants, and dilute contaminants by effective ventilation. Vacuum Cleaners. Many vacuum cleaners release much of the fine dust they just picked up through a regular filter. Vacuums equipped with HEPA filters filter air before it's released. The Carpet and Rug Institute (http://www.carpet-rug.org/index.cfm) has a "Green Label" program that certifies vacuums that meet dust removal requirements. Ventilation may reduce roof temperatures in sunny areas. Soffit vents and ridge vents are the most effective attic ventilation. A rule of thumb is to use 1 sqare foot of net vent opening for every 150 square foot of insulated ceiling or 1:300 if the insulation has a vapor barrier. Electrical vents are not recommended since they can remove conditioned air from a home through ceiling leaks. Whole house fans (or attic fans) are less expansive to operate, but bring in outside air with dust, moisture, pollen etc. Smoking in the home should not be permitted for obvious reason. Smoking should be done outside at least 25 feet away from sealed entries or windows. Reduce indoor contaminants and hazardous particles and chemical pollutants that are odorous, irritating, and/or harmful to the comfort and well being of installers and occupants. -Make sure to ask for ventilation, since it is still not included in the building code in many states. -Be aware that moisture damages window sills and sashes and promotes mold build-up which can lead to serious health problems.